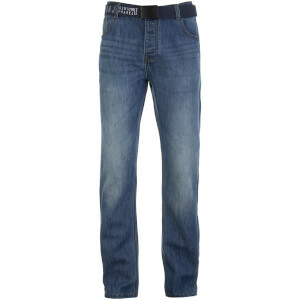 Men's 'Furio' straight fit jeans with a dark wash and subtle fading from Smith & Jones. Crafted from a durable cotton blend, the classic five pocket jeans feature a button fly, metal rivets and a removable, branded canvas belt. Complete with a leather look waistband patch, brand embroidery on the coin pocket and contrast orange stitching. Very nice jeans , good fit , but for me they are too narrow - not quite a good fit to my feet . My son got the same , but the size is 28" and he was very pleased - will buy some more , price is two times lower than in Moscow . Very fast delivery to Russia . zavvi is the best shop in Europe !